Our fussy old man of a dog loves this food, although i wish it came in a zip lock bag to save any spills or smells in the fridge. I have two dogs who are quite fussy and I normally like making their food, but I tried this as something different and they scoffed it up! This is a great readmade dog food. We buy this as a special treat for our boy and he is very excited when it is offered to him, with not a crumb left in his bowl. My three dogs have adored 4Legs. It is utterly amazing to watch them scoff food, instead of leaving it. I never have to worry about them not getting enough nutrition with this mac and veg meal. 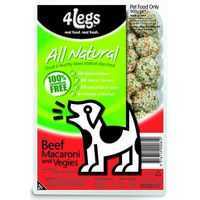 How would you rate 4legs Adult Dog Food With Macaroni & Vegetable?